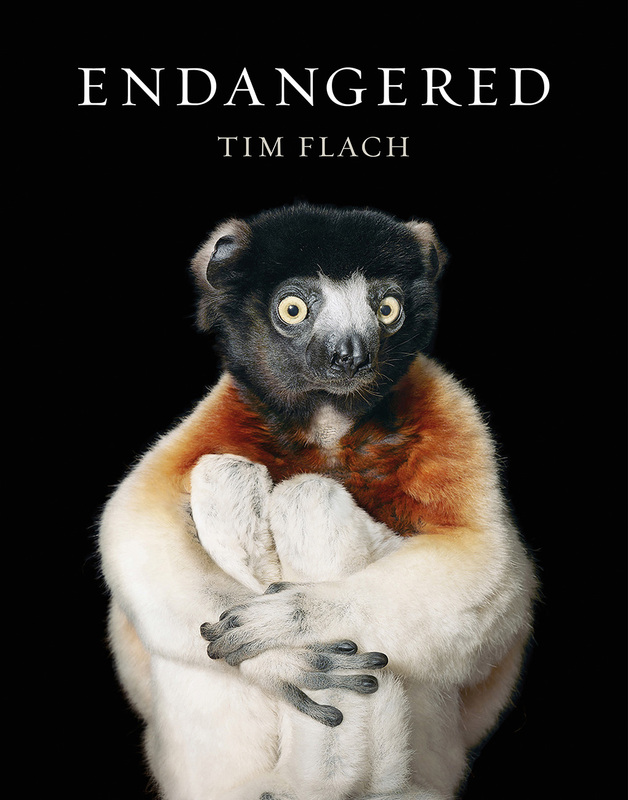 Staring at us from the front cover of Tim Flach’s new book, knees clasped to his chest like a child on his first day at kindergarten, is a rare sifaka lemur. His fur – black on his head, with a cream body and rich auburn chest – looks irresistibly soft. We can make out every tiny detail, from the fine grain of his nose, to the cuticles on his fingernails. There is a distinctly worried look in his eyes, as if he is about to get punished for something he didn’t mean to do. If this sounds anthropomorphic, it’s meant to. In the foreword to this extraordinary book, Flach, best known for his beautiful, stylised portraits of dogs and horses, quotes George Schaller, an eminent biologist: “Conservation is based on emotion. It comes from the heart and one should never forget that.” By creating portraits that emphasise animals’ personalities, Flach aims to bridge the “otherness” dividing them from humans, which he believes is essential to getting us to care about animals. It’s also a wake-up call – but not for the obvious reasons. The first few photographs are followed by a double-page spread, black but for 16 words picked out in white: “The title of this book is ‘Endangered’, but the question is: to whom does this apply?” At first, this seems like a straightforward question. You leaf through the pages, all of them filled with exquisite photographs – some portraits, taken in a studio or set, others of creatures in their natural habitats – and read the brief, interleaved paragraphs. Each has a story to tell – of disappearing habitats, human encroachment, disease and poaching, as well as of efforts to conserve these fantastic beasts. Then you turn to the index at the back of the book, where a thumbnail of each plate is accompanied by the story of how this creature fits into the global ecosystem, and the real message becomes clear: yes, these creatures are indeed endangered – some of them irrevocably so – but their lives are so entwined with ours that their extinction threatens our continued existence. And, by killing them we are not only destroying our anthropocentric life-support system, but our humanity too. It is a chilling message, delivered with warmth. Already rare, pangolins are being hunted to extinction, for their meat, their skin (used for handbags) and scales which, in the Far East, are believed to cure all manner of ailments. It is extremely difficult to catch a glimpse of them in the wild; they are shy and nocturnal and, at the first scent of danger, they curl into a ball, like a scaly hedgehog. While this is some defence against their natural predators, it makes them easy prey for human hunters. In this picture, a young white-bellied pangolin has wound itself around its mother’s tail. 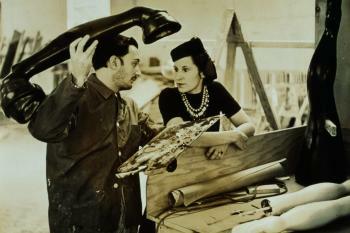 Flach’s genius at lighting catches the delicate fluting on the scales. 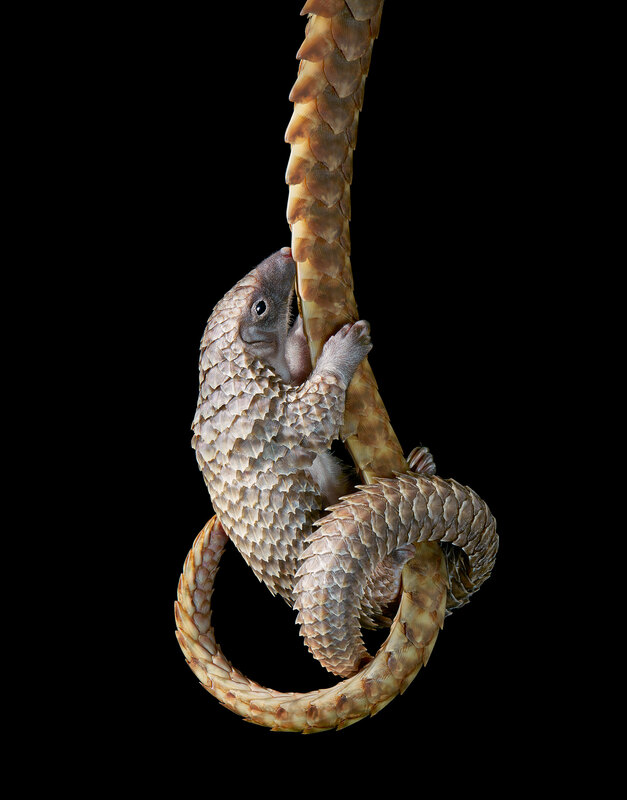 Although this was shot in a studio against his trademark black background, the message is clear: just as it clings to his mother, so pangolins cling to a precarious existence. Flach is a master of macro photography. Both of these shots pick out details that would be impossible to see with the naked eye and imbue them with an ethereal beauty. 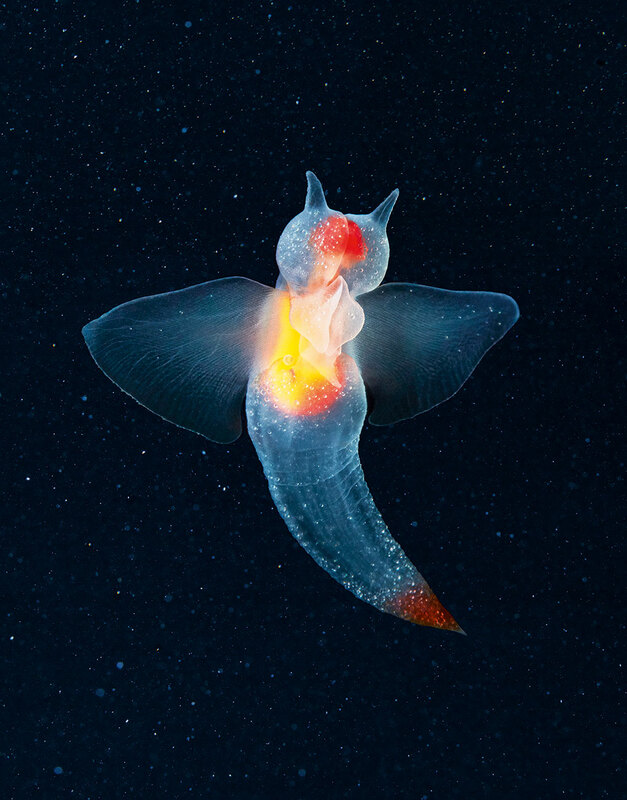 Sea angels are translucent molluscs no more than 5cm long, with stunning flashes of primary colour inside their heads, bodies and at the tips of their tails. However, if the oceans continue to acidify (the result of carbon dioxide dissolving into water) their future – and that of the food chain in which they are a vital link – will be in peril. 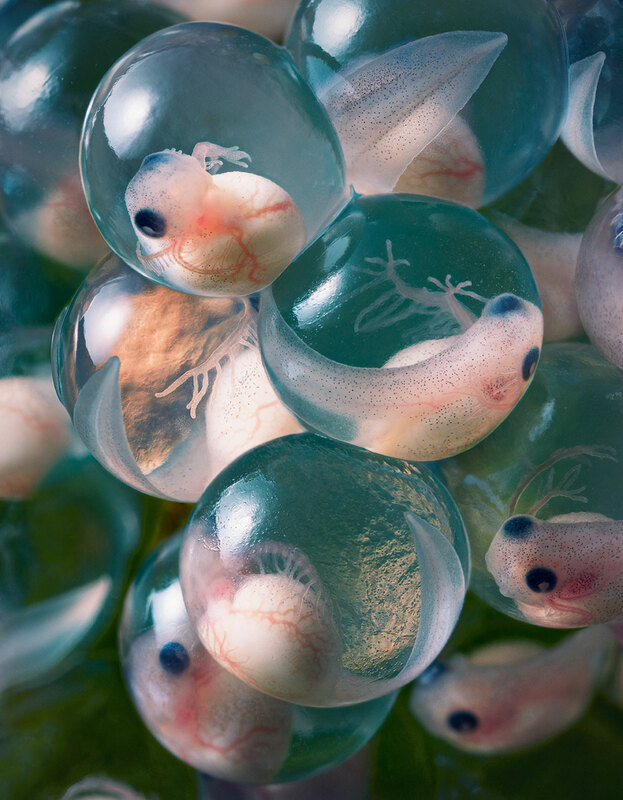 Climate change is also wreaking havoc on the breeding cycle of the yellow-eyed tree frog, whose spawn gaze at us from within their egg sacs. They are increasingly hatching at irregular times, which confuses their predators, again rupturing the food chain. And if that weren’t bad enough, they’re being hammered by chytridiomycosis, a fungal disease that has destroyed more vertebrate species than any other in recorded history. 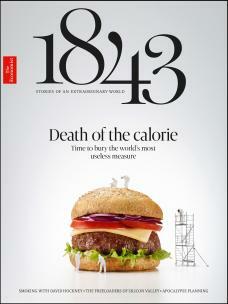 On one full page, there’s a photograph, taken from above, of a single ploughshare tortoise on a black background. 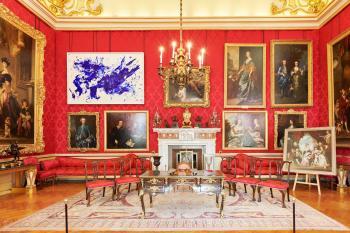 Apart from the hexagonal shapes, the eye is drawn to the letters and figures scarring its back. These, as Flach points out, have been engraved in the shells to put off thieves. Once you learn that, the disfigurement turns into an enhancement. 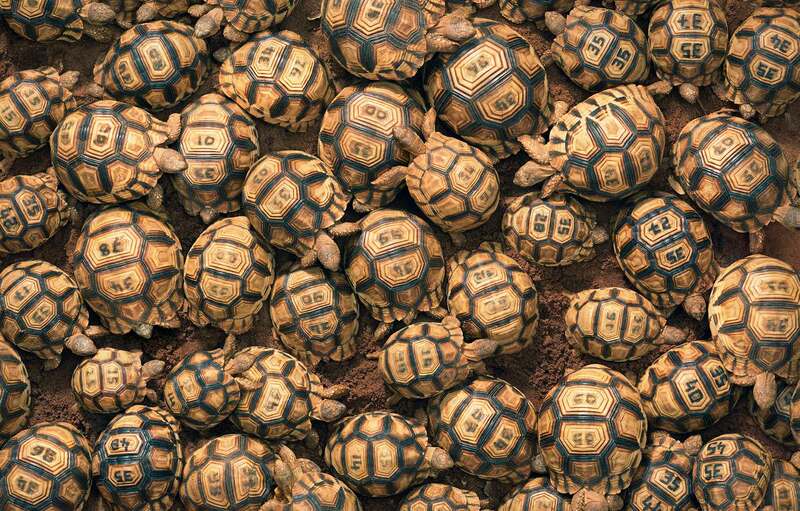 Turn the page and on the following spread there’s a riot of ploughshare tortoises, scrabbling around on the sand and on each other. They resemble a bowlful of unpolished opals: precious, rare. Looking at Flach’s work you can’t help thinking about the people these creatures resemble. 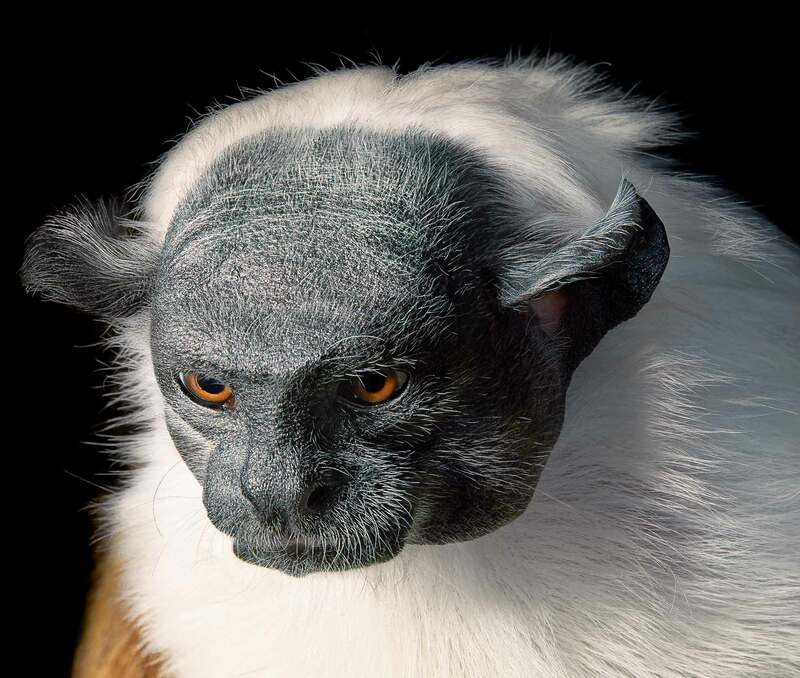 In the case of the pied tamarin, an extraordinary-looking creature with a fine-grained black face and glorious ruff, it’s more a case of resembling a certain Jedi master. The tamarin’s tiny home range in the north-eastern Amazon is shrinking as the city of Manaus expands. The subject of this picture, you sense, is contemplating his uncertain future – but even Yoda may not be able to stop the rapid urbanisation of Brazil. 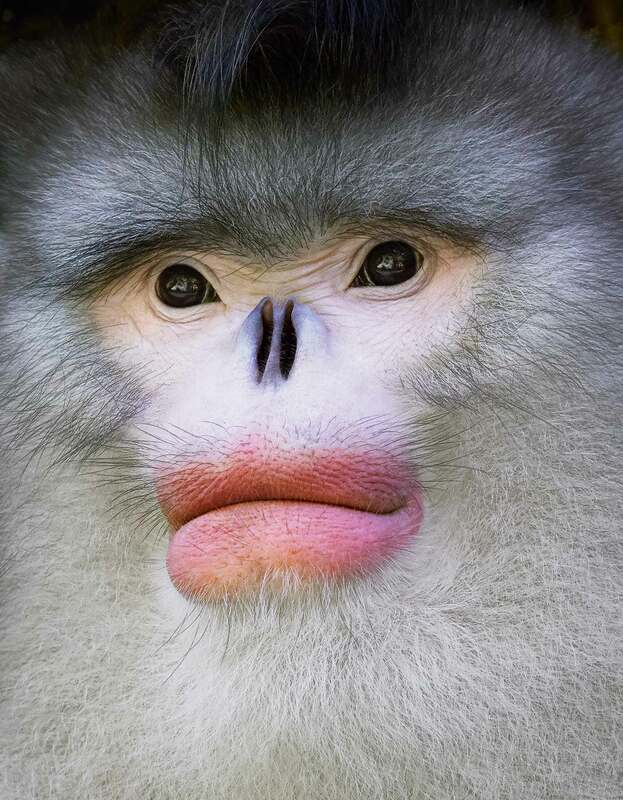 With their plumped-up lips and and cauterised mauve nostrils, Yunan snub-nosed monkeys look as if they have spent too much money on a bad plastic surgeon. They are still curiously alluring, and one of the few monkey species to co-exist in relative harmony with each other. They live high in the Hengduan mountains, in south-western China, surviving the freezing winters by huddling together on tree branches. Locals think of them as their ancestors and call them “the wild men of the mountains”. Despite the recent creation of a protected reserve around their habitat, the number of remaining monkeys may be too few to ensure the genetic diversity needed to breed successfully. There is magic in seeing a host of fireflies twinkling in ancient woodlands. Yet what may appear to be a lovely light show is actually, scientists have begun to discover, a secret and astonishingly precise language. 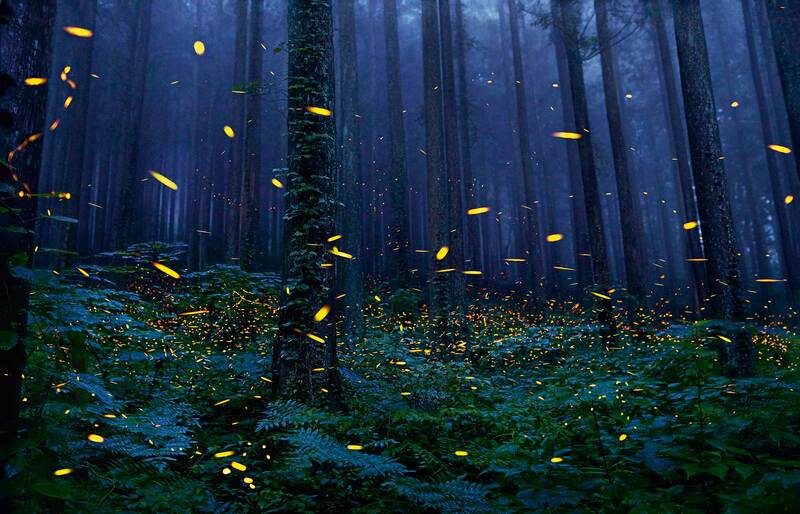 The conversation, however, is dulled by light pollution, which is encroaching into the fireflies’ habitat. 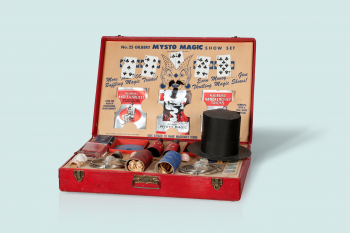 With this picture, stretching across a double page, Flach invites the reader into a blue, glimmering fairyland that is becoming harder and harder to see in the wild. This guy is pure comedy, the sort of lounge lizard who would have worn a wide-lapelled brown suit in 1970s Britain. 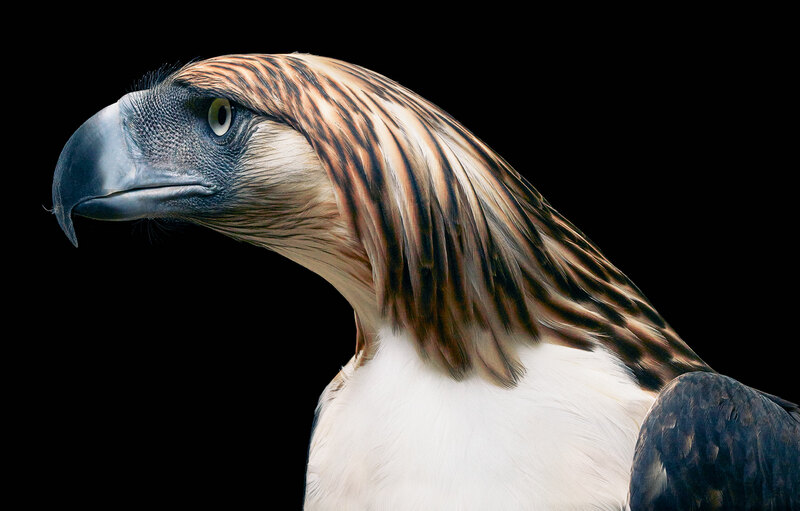 His name, Flach reveals in the index, is Pag-asa (Hope), and he was the first eagle to hatch in captivity in 1992. The population of these huge predators (their wingspan is over two metres) numbers in the hundreds. 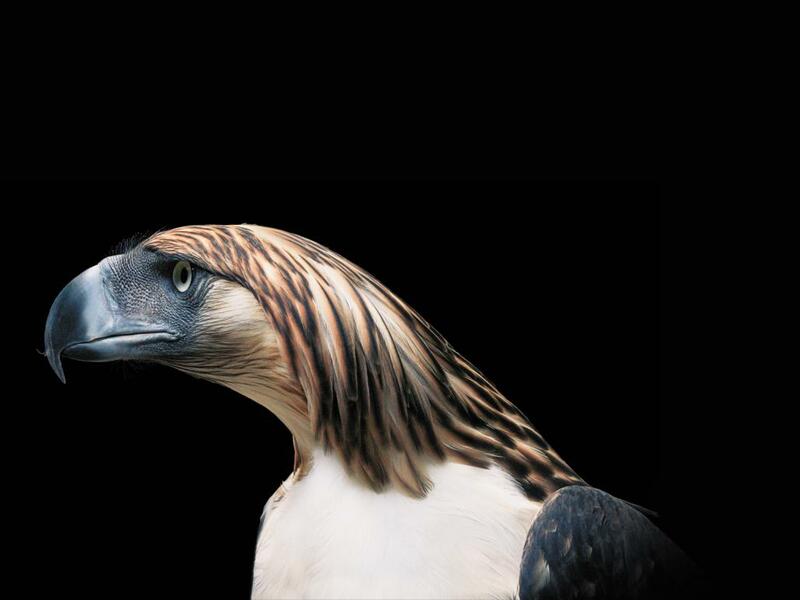 While there are efforts to protect what in 1995 was named the Philippines’ national bird, hunters and shrinking habitat mean its future is still in peril. 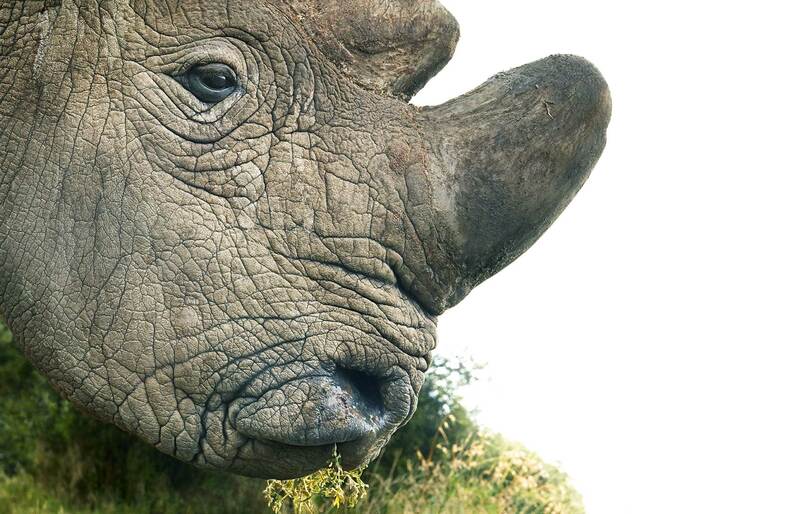 This is Sudan, the last remaining male Northern White rhino. He lives in a reserve in northern Kenya with the last two females. When they die, so does their gene pool. 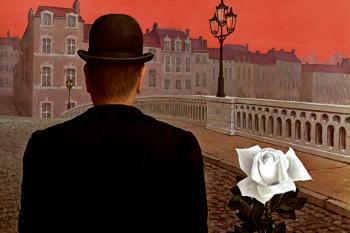 Flach’s portrait of him is ineffably sad. There’s a faraway look in his small eye, and a frond of vegetation hangs from his lips, as if he has stopped eating in order to ponder the meaningless of his future. If current poaching trends do not reverse, the Northern White may be joined in extinction by the other five rhino species fighting for survival. This ancient species, which once coexisted with hairy mammoths and sabre-toothed tigers (and other stars of the “Ice Age” films) lives on the bleak Eurasian steppes. 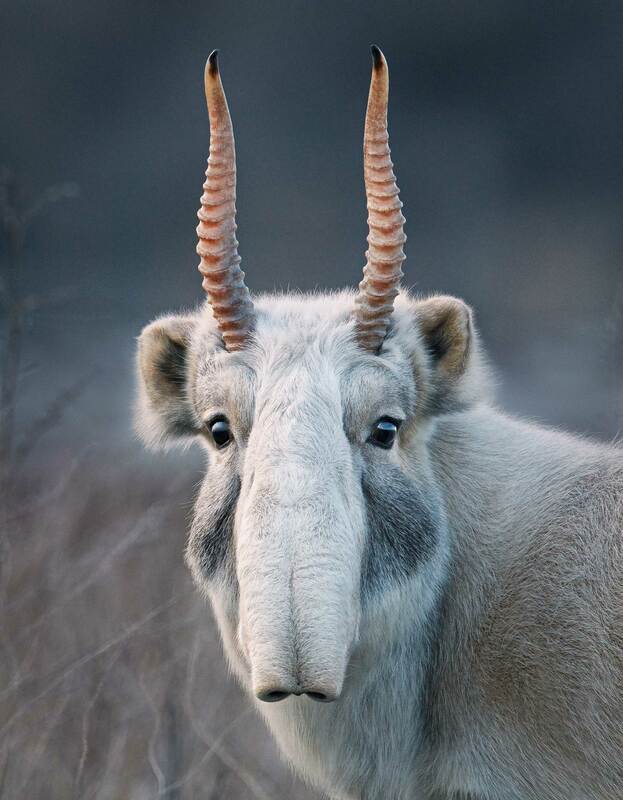 In recent decades, however, the number of these long-nosed antelopes has dropped dramatically – as a result of disease (thought to have been a by-product of climate change) and poaching (the males’ horns are used as painkillers and anticonvulsants in traditional east Asian medicine). 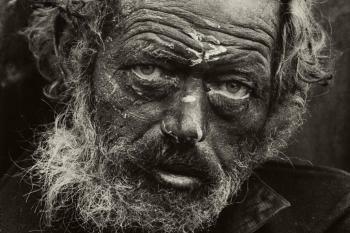 In this picture, a young male looks straight into Flach’s lens. While he is in sharp focus, the background is blurred; only in his beseeching eyes can we make out a reflection of the open plains on which he lives.